Why’s there a little person in my button? I was walking around the new VMware Promontory campus today and found this button. I’m tempted to press it, but I’m not sure what it will do. Send little stick figures to attack me? Stick me in a little house? Update: My apologies to anyone who couldn’t comment. My cache plugin cached the captcha. Oops. That’s been disabled now, so try again. This entry was posted in Uncategorized and tagged Buttons, Promontory, VMware. Bookmark the permalink. Looks like VMWare has taken LeafTag to a whole new level… Awesome or frightening: you decide! Incidentally, how is “banana” any more “food” than “human”? In fact, “newspaper” and “lamp” are eaten by *something* eventually. Still, I’m going with “banana”. Jay: This is right outside the kitchen rooms. Sandy: You bring up an excellent point. I guess I should say “food in the traditional sense meant for human consumption.” Or is that still too vague? 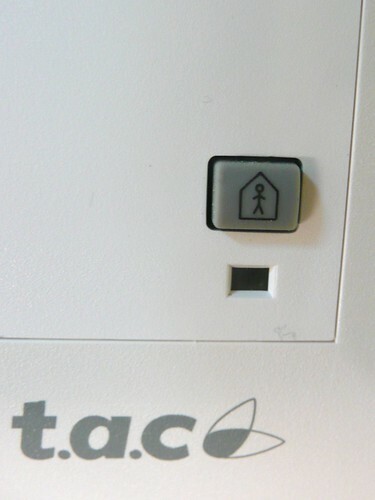 TAC is a building security company so I’m gonna guess the button calls the guard. He’s in his little guard-house, see? It’s too narrow to be a normal house. An LED below it glowed menacingly for what felt like an eternity, but was really about 2 seconds. I figure it was a warning. perhaps it shows a little video of whoever is outside the door? The little guy is the person you see through the key hole? very strange. lets call in the usability experts on this one. Oh wait.. this isn’t a Free Software project..
That is clearly the xkcd button. This button is there to be pressed by curious people. Every time you press, the led blink to say “here another one”. And update a “curious” counter. There’s a “curious” log somewere in a big-and-secret server, in the hands of some evil big company ready to rule over the world… really! I like this one: it turns you, your family and your dog into sarcastic geeky stick peoples. your cat becomes a lolcat. I agree with the humans not food comment. Lets make some little piece of hardware to push the button every rand() % 3600 seconds. Hmm, no sign lit up saying “Please do not press this button again”? Christian beat me to it! It kind of looks like a dude in a coffin. Perhaps pressing it kills a dude in some other room at VMWare? It’s a stick figure in a little tiny space capsule. What that obviously means is that pressing the button shoots someone into space. The light you saw was the launch notification. I wonder who you shot into space. Maybe it was someone you know? A complete stranger? Maybe the next time, IT WILL BE YOU! Michael, get off the drugs!